Stop, or my agent will shoot! Those who just haven’t gotten enough of Kevin Hart (after all, how can you…? ), Ride Along is here to let 2014 pick up where 2013 left off. Indeed, those Grudge Match commercials have barely stopped foisting Hart’s rapid-fire repartee above a couple of actors named De Niro and Stallone. 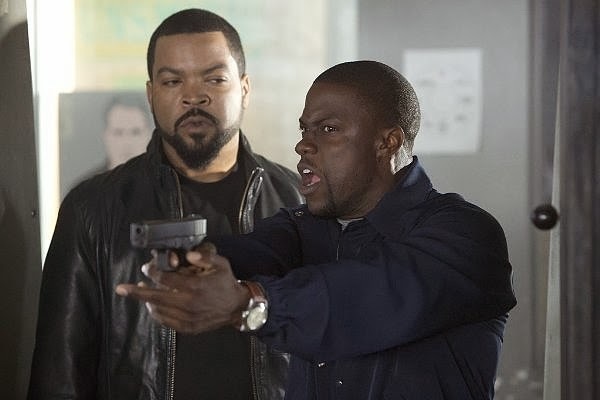 Now comes this anti-buddy cop flick starring Hart alongside Ice Cube’s Scowl™ that’s as uneven as it is derivative. Hart plays runt-sized Ben, a school security guard with aspirations of becoming an Atlanta police officer and marrying Angela (Tika Sumpter). Neither sits well with James (Scowl™), an undercover Atlanta detective who views the diminutive, video game-obsessed Ben as unworthy of the force and his baby sister. So James invites Ben on a daylong ride along designed to expose Ben’s fecklessness. There are the expected Training Day, 48 Hrs. and Friday references. And once again proving the axiom that more is less, four screenwriters cook up a rudderless series of scenes centered exclusively around the two leads’ Mutt and Jeff routine. Scowl™ snarls and glares while Hart feverously spins his manic schtick. In fairness, Hart’s live-wire comedic act occasionally hits the mark and is the only reason to slog through this cacophony of cliches. But, Ben’s persona is as scattershot as Hart’s parlance—one minute he’s squealing with fear, the next he’s full of bravado and shooting a reluctant CI in the shoulder; one minute he’s a dimwit, the next he’s untangling a Serbian arms investigation that James’ has been freelancing. Beyond being plain unlikeable, we’re told James is a surly loner, yet he has colleagues standing ready to wholly embarrass themselves in public for the sake of nominally embarrassing Ben. Indeed, the only other entities that director Tim Story provides with any appreciable amount of screentime are the leggy Sumpter and James’ department-issued muscle car. Come to think of it, they have more personality than the rest of the cookie-cutter characters, including the blustery doubting sarge and double-dealing partners. Laurence Fishburne ambles along for a cartoonish bit part that, if nothing else, confirms for the audience that the cast is aware how bumpy this Ride Along is. Good review Neil. Though it's definitely not a great movie, it was fine for an-hour-and-a-half. Also, it's January, so you have to cut SOME slack.